The College of Arts, Humanities and Social Sciences hosts a variety of events every year that enhance our students academic experience. Students have a chance to meet professionals in their field of interest in the classroom and at major University events such as the annual Fiesta Jazz Festival, where world renown artists and musicians host workshops for our students, and the Las Americas Letters Series, an annual conference that encourages empowerment through creativity and cultural understanding by bridging the Americas through the work of authors, artists, musicians, scholars and educators. Stage productions by St. Mary’s students go way back in our history, at least to 1895, as documented in our archives, including old Rattler newspapers, performances by groups called The Mission Players, The Cameo Players, The St. Mary’s Theatre Guild, St. Mary’s Drama Club and The Shoestring Players. Every year our StMU Theatre troupe performs in the spring and fall semester. 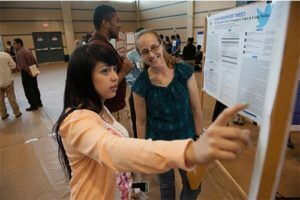 Many of our events are also open to the public, allowing the San Antonio community the opportunity to be a part of the learning experience at St. Mary’s University. We invite you to learn about our annual and special events below and additional events listed on our campus calendar and join us at our next event.